There are several reasons you might want to locate and read your water meter. You might be interested in finding out how much water you actually use in a day. By reading your meter at the beginning and the end of the day, you can compare the two totals to find out how much water your family used. Another reason is to check for leaks. If you turn off all the faucets in your house, look at your meter and if the little red triangle (low flow indicator) is spinning, chances are you have a leak somewhere. You will need to locate your water meter; it is usually located near the curb in front of your home in a concrete box. Carefully remove the lid by using a large screwdriver or pliers to lift the lid. Reading a water meter is similar to reading the odometer in your car. Read all the numbers from left to right. Do not include the numbers to the right of the decimal point or the numbers with a black background. 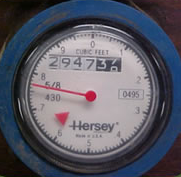 To calculate the water usage, subtract the previous meter reading from the current reading. 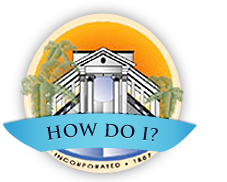 For billing purposes, water consumption is measured in CCF (hundred cubic feet), which equals 748 gallons. 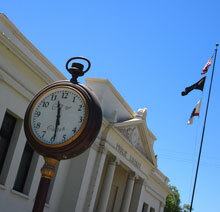 Colton water charges are based on a monthly charge based on the size of the meter and a charge for water consumption. Note: Water consumption charges are $1.61 per HCF.